We all know E-Commerce is on the rise in India – just look at the number of new online stores getting launched and the traffic that sites like Myntra, Flipkart and Amazon command! In India, the total internet subscribers are around 165 million, out of a population of more than a billion, roughly accounting to less than 13% internet users as a percentage of population vis-à-vis 34% of world average. According to a recent Internet and Mobile Association of India report India has 20 million internet users with 11 million online buyers. Though currently the online market is relatively small with Indian e-commerce pegged at $9.5 billion (Rs 47,349 crore) last year (including online travel bookings), would soon be a force to reckon with, that which would take on physical retail head on, possibly forcing the closure of many physical stores (read: brick-and-mortar). The retail market, which was at $3.8 billion (Rs 19,249 crore) in 2009, is projected to grow to $12.6 billion (Rs 62,967 crore) by the end of 2013, and also contributing around 4% to GDP by 2020. 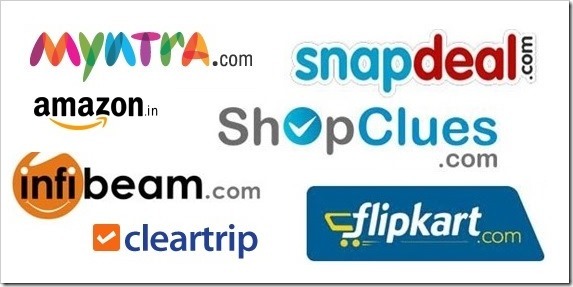 Out of the total e-commerce share in India, online travel (spearheaded by sites like Makemytrip, Yatra, Cleartrip & Others ) grew 30% last fiscal and currently make up for 71% of the total Indian e-commerce space. E-tailing (electronic retailing) has grown by 59% and its share in e-commerce has rose to 16% in 2012 from just 10% in 2011. Currently, foreign direct investment (FDI) is not permitted in e-commerce, though up to 51 per cent FDI is allowed in multi-brand retail and 100 per cent in single brand. The prohibition of FDI in e-commerce has forced many businesses to change business models from direct-to-consumer retail to a marketplace model (since marketplaces are allowed under the current FDI norms). Around 15-20 e-commerce businesses have shut shop or merged in the past year and few of the bigger players like Indiatimes Shopping had to scale down their operations, since the investments has significantly dried up and the existing investors playing it safe by investing in players like Flipkart and Snapdeal who are already firmly established in the country. Seeing the potential of the Indian market and the time ripe for it, Walmart Asia President and Chief Executive Scott Price is learnt to have written to Finance Minister P Chidambaram that “several other sectors stand poised for exponential growth and are ripe for foreign investment, and foremost among them is e-commerce”. Mukesh Bansal, chief executive of Myntra, a site focused on fashion and lifestyle, said the company expected 20 per cent revenue from mobile phone transactions by 2013-end and 40 per cent in the next two years. The Kishore Biyani-owned Future Group has also announced a big-bang e-commerce initiative. Others are also betting big on it, considering Amazon has entered India. Flipkart’s recent fund-raising exercise nearly turned on its head the argument investors were moving away from Indian e-commerce. The company recently raised $200 million from existing investors, thus becoming the poster boy of Indian e-commerce. Snapdeal, Healthkart and others have also managed to raise capital. The number of mobile phone subscribers in India are around 868 million, far more than the internet subscribers. Mobile commerce should drive the e-commerce market, and might account for around a quarter of the e-commerce pie by 2015. Secure payment gateways in India are another challenge. Opening up of FDI in e-commerce is another crucial requirement. So the bottom-line is, while we all are busy rallying against FDI in retail and shouting “Go Back Walmart”, someone (read: Indian e-commerce) amongst ourselves might prove to be the traditional retail’s nemesis! Growing Ecommerce can never be a threat to Traditional Retail Market. India has seen recent boom in E-commerce space as well as Retail Markets are growing at larger pace in form of Malls. Retailers are shifting to malls for more business. Retailers are also selling online. We at Oshopindia have been promoting small retailers to come online and sell at our marketplace. We feel both Traditional and Online Retail Market will grow simultaneously.